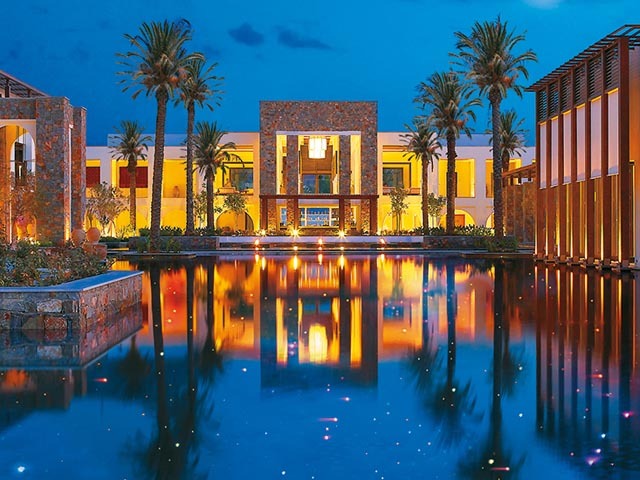 Amirandes is an exclusive beachside resort that epitomises Cretes most inspiring features: beautiful architecture, warm hospitality, excellent cuisine and stunning land and seascapes. These elegantly decorated rooms offer all the comforts and amenities that set the standard at Amirandes. The stylish bathroom has a shower cubicle, bath and a wash basin with vanity unit. The enclosed balcony, with its glass and wood panels, is an excellent breakfast nook offering panoramic view to the sea or the landscaped garden. Superior rooms with sea view sleep up to 2 persons. Ideal for families with two children this comfortable family accommodation is surrounded by beautiful gardens. The master bedroom and living room can be separated by sliding doors to become a childrens sleeping area. Superior Family Guestrooms feature a balcony or an outside terrace with a spacious garden. A bathroom with shower cubicle, bathtub, WC and double washbasin vanity unit enriches the comforts of the Superior Family Rooms. The luxury guestrooms offer a complete feeling of luxury and comfort. These rooms are made up of one elegantly decorated bedroom with sitting area. The generous bathroom has a separate shower cubicle, a washbasin with a spacious vanity unit, a bath with waterfall lighting. 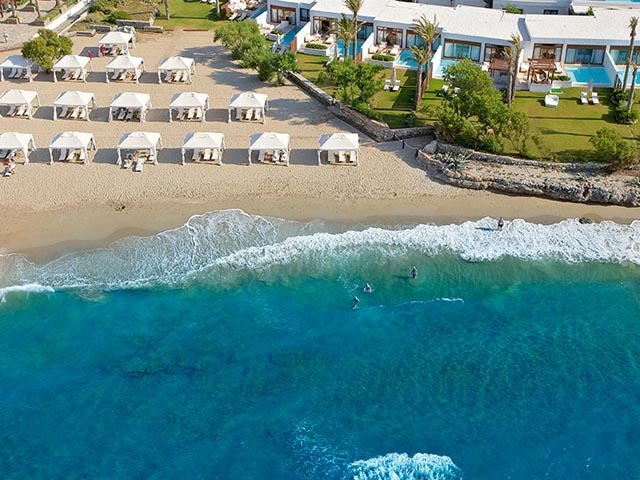 The bed faces either the Cretan Sea or the Lagoon, while a daybed is set next to a picture window where you can stretch out to read or just daydream. Private enclosed balcony with glass and wood panels offers breathtaking panoramic sea or sea and lagoons views. Floor to ceiling glass panels fold back to fuse the balcony with the open plan, light-filled guestroom. The Amirandes Junior Family Room, ideal for a family with one child, boasts the comforts and amenities that set the standard at Amirandes with the added bonus of an individual pool in a beautifully landscaped garden. The elegantly decorated bedroom features additionally one sofa bed as a sleeping area for the child. The stylish bathroom offers a shower cubicle, bath, WC and a wash basin with vanity unit. A spacious garden furnished with sun beds and umbrella is ideal and relaxing and enjoyable family moments are ensured by their private pool. 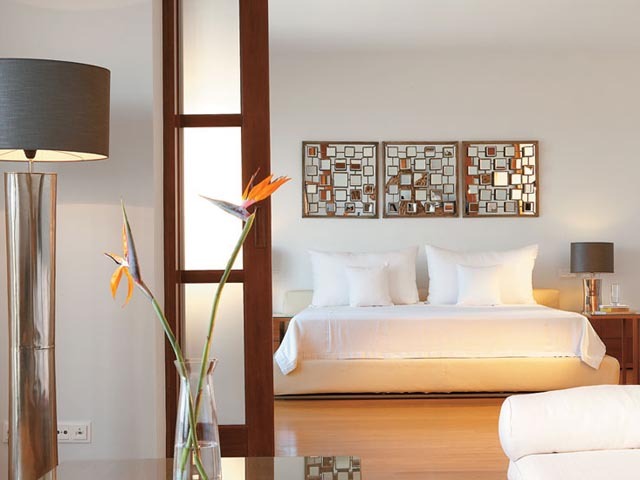 The Amirandes Family Suites feature ample space for distinct dressing, sleeping, and living areas. Ideal for families with two children. Both the master bedroom and living/sleeping area open onto to the front terrace. The master bedroom and living room can be separated by sliding doors to become a childrens sleeping area. These ground floor family suites feature a terrace with a dining area and direct access to an outdoor pool. A spacious garden furnished with sun beds and umbrella is ideal for relaxing and enjoying quality family time together splashing around in your pool. A bathroom with shower cubicle, bath, double wash basin vanity unit and a walk-in dressing area enriches the comforts of the suite. 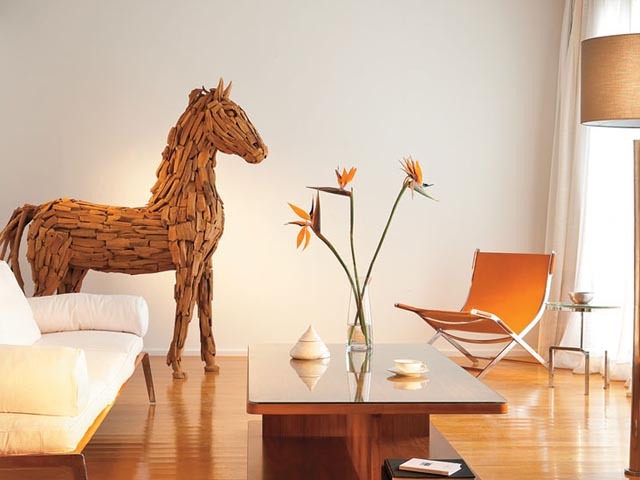 Rooms with ample space for distinct dressing, sleeping, and living areas. Ideal for families with two children. Both the master bedroom and living/sleeping area open onto to the front balcony. The master bedroom and living room can be separated by sliding doors to become a childrens sleeping area. A bathroom with shower cubicle, bath, double wash basin vanity unit and a walk-in dressing area enriches the comforts of the suite. A cozy guestroom nestled among gardens, designed with lifes luxuries and the flair of al fresco living. The bungalows are framed by: a seafront garden area and most by a small walled garden directly outside the bathroom so you can soak up the garden from the tub. Combined sleeping and living quarters feature a double bed. Theres a generously-sized bathroom with two washbasins and dressing area plus separate bathtub and shower cubicle. The elegantly furnished luxury bungalows stand on the first row of the seawater. Nestled in the hotel gardens with amenities designed for refined living. A generous dressing and grooming area with separate his-and-hers sinks separates the en-suite bathroom from the sleeping area. The bathroom is designed so that you can enjoy the view when soaking in the impressive bathtub. Bungalows open out onto a spacious terrace, perfect for lounging day or night. 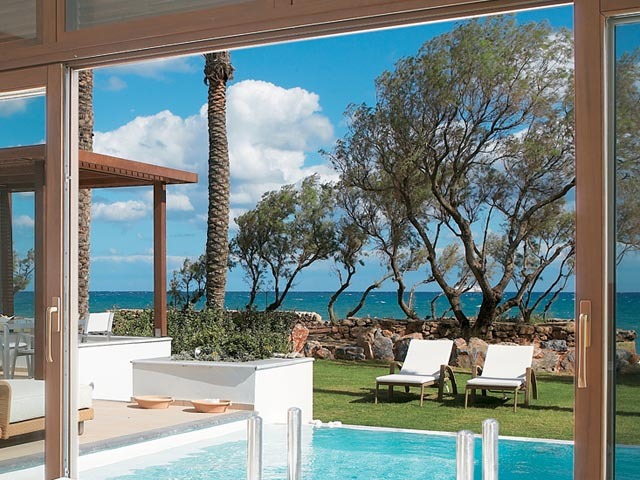 Romantics should look no further than these deluxe honeymoon suites in Crete! This luxury seafront accommodation was designed with newlyweds in mind, from the stylish bedroom to the private terrace with the sea view heated swimming pool. Romance is sure to blossom in the king-sized four-poster bed with direct sea views. The generous bathroom consists of a shower cabin, two washbasins, a 15 LCD TV and en-suite wardrobe. The private terrace with romantic love seat and outdoor lounging furniture guarantees special moments of relaxation overlooking the Cretan Sea. 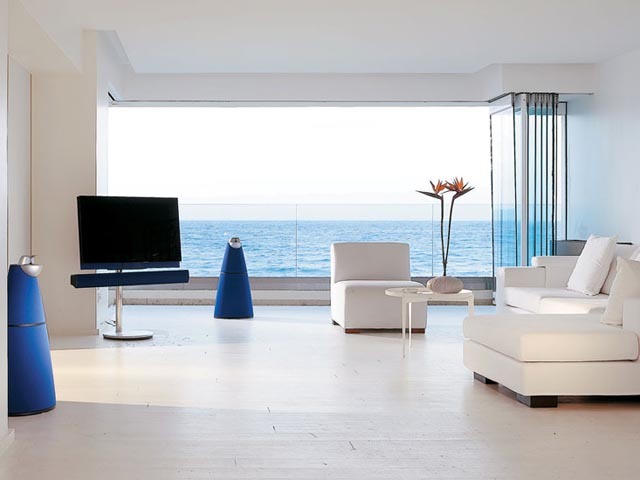 These open plan suites offer a magnificent view to the sea. The white-coloured furniture, the white wooden floor and the sizable wardrobe with full-length mirrors impose in the luxury suite along with the B & O 26 flat screen TV, the B & O cordless phone and the B & O Stereo Sound System. 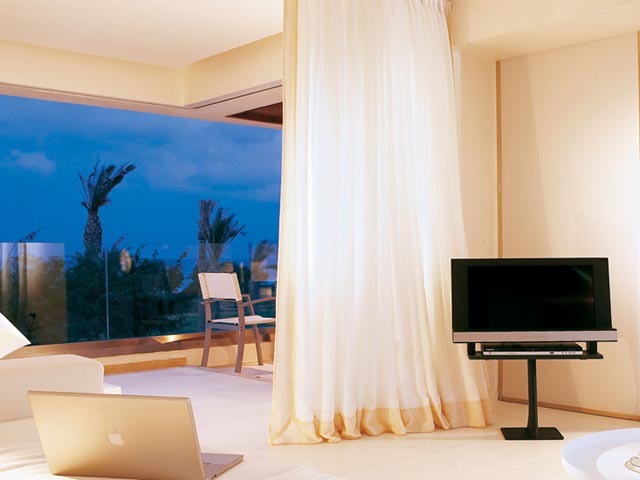 The king size bed is placed next to the balcony door, enabling a magnificent view of the Cretan Sea and sunset. Balcony doors made of glass can be folded to the side transforming the suite into a huge balcony. The luxurious designed bathroom with an open bathtub, two washbasins with ample vanity unit, and separate shower cabin offers unique moments of relaxation. The outdoor dining area gives you the opportunity to enjoy the view to the Aegean Waters while dining and relaxing. These open plan suites offer a magnificent view to the sea. The white-colored furniture, the white wooden floor and the walk in wardrobe with the full length mirrors impose in the luxury suite along with the motorized B & O 32 flat screen TV with the integrated DVD System, the B & O Loudspeakers and the B & O cordless phone. The king size bed is placed next to the balcony door, enabling a magnificent view of the sea. Balcony doors made of glass can be folded to the side transforming the suite into a huge balcony. The luxurious designed bathroom with an open bathtub, two washbasins with ample vanity unit, and hydro massage shower cabin offers unique moments of relaxation. The outdoor dining area gives you the opportunity to enjoy the Cretan Sunset while dining and relaxing. 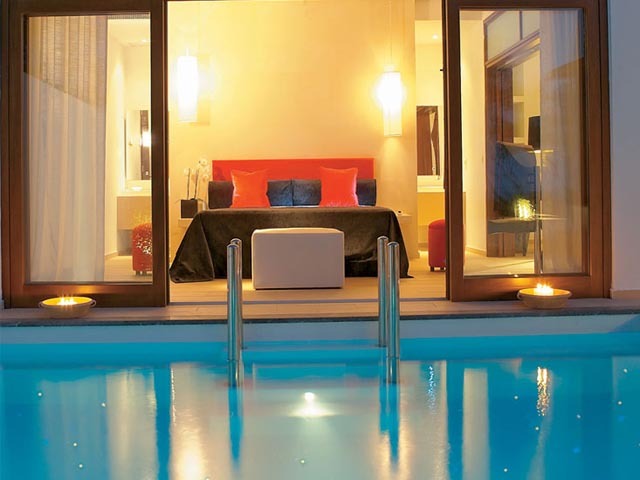 The magnificently elegant Luxury Junior Suites with private pool provide an ideal sense of style and sophistication. Especially designed for those who want to keep fit during their holiday. They are composed of a sizable and beautifully decorated open-plan living area with raised king-sized bed. A wooden partition behind the bed interconnects with the luxurious bathroom. The bathroom is extravagant (24 m2) and includes a bathtub, washbasin with vanity unit, separate shower cabin, WC and a gym area with exercise equipment and LCD TV. A glass door leads from the bathroom to a private patio where there is an outdoor rain shower.The large front terrace has direct access to a private temperature-controlled pool with smooth current for exercise (water temperature over 25 C at extra charge). The evening lighting of the pool gives an outstanding feeling of romance. Special features include full-length mirror, motorized B & O 32 LCD TV with integrated CD/DVD System and B & O cordless phone. These magnificent suites were designed for the sophisticated travellers who demand superior comfort that matches their desire for elegance and style. Ideal for families with two children and sportive parents who seek the maximum of privacy. The Amirandes VIP 2-Bedroom Suites are composed of a master bedroom with a raised king-size bed and a stylish living area. A wooden partition behind the bed interconnects the master bedroom to the luxurious bathroom. The bathroom includes a bathtub, washbasin with vanity unit, WC, shower cabin. Gym area with exercise equipment and LCD TV. Second bedroom is accessible from the entrance hall. The large front terrace has direct access to a private temperature-controlled star pool with smooth current for exercise (water temperature over 25 C at extra charge).. 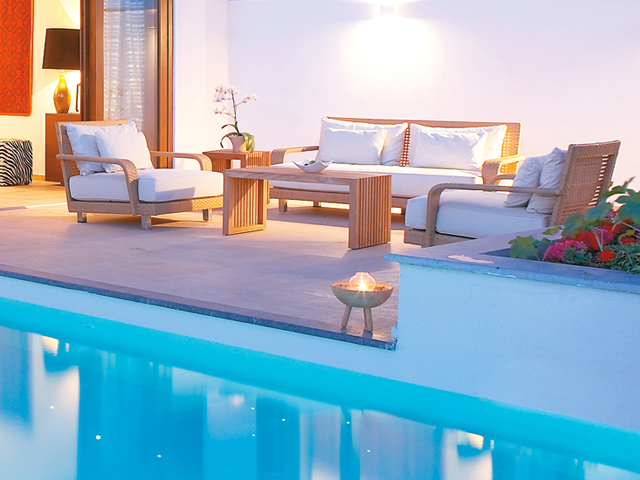 The villa is set in an elegantly landscaped courtyard and a private terrace with a luxurious infinity pool. The yard entrance, and in some villas a small fountain, gives a first impression of the inviting scenery. Perfect for a family or a couple who want the maximum privacy. On the ground floor, there is an entrance hall with WC/shower and a spacious living area, which can be converted to a bedroom for 2 children. Panoramic glass doors lead onto a sun deck with sun beds and umbrella, a sunken lounge and dining area and a private, temperature-controlled infinity pool, that seems to melt into the horizon (water temperature over 25 C at extra charge). On the first floor, the master bedroom is airily decorated with wooden floor and local stone elements. Luxurious bathroom with dressing area, a state of the art basin, separate WC and shower cabin. The private, sea view balcony beckons for romantic breakfasts or late night drinks. This elegant two level residence is ideal for a larger family with a nanny or two couples who want the maximum of privacy. The yard entrance with a landscaped garden gives a first impression of the inviting scenery. On the ground floor, there is a spacious living area, which can be converted to a bedroom for 2 children. Stylish second bedroom and WC/shower is found off a small lobby.Panoramic glass doors lead onto a sun deck with sun beds and umbrella, a sunken lounge and dining area and a private, temperature-controlled infinity pool, that seems to melt into the horizon (water temperature over 25 C at extra charge). On the first floor, the master bedroom is airily decorated with wooden floor and local stone elements. Luxurious bathroom with dressing area, a state of the art basin, separate WC and shower cabin. The private, sea view balcony beckons for romantic breakfasts or late night drinks. 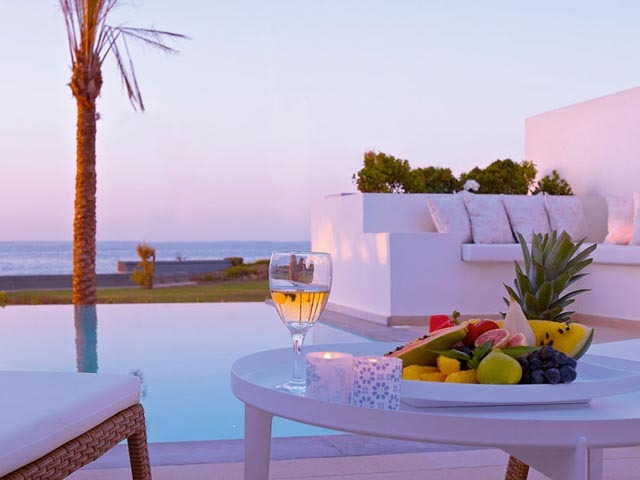 The elegantly decorated villas are especially designed for guests seeking the utmost in exclusivity and luxury. Consisting of two bedrooms, these small residences are perfect for a family. The master bedroom has a living area in an open plan style and a generous sea view bathroom. The luxurious bathroom features a double stone basin vanity unit, an impressive Jacuzzi bathtub, separate shower, WC and LCD TV. The second double bedroom has a 26 LCD TV, a bathroom with a Noir washbasin and separate shower cabin, leads to a landscaped courtyard. The impressive master bathtub has views to the sea, the private infinity pool and the outdoor veranda with comfortable furniture in the terrace. 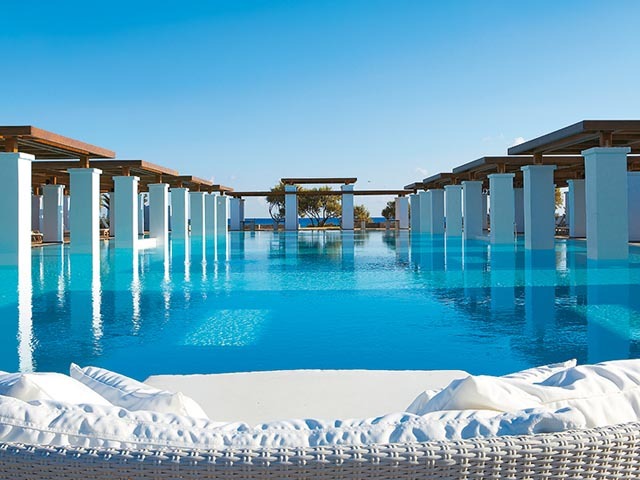 The private infinity pool is temperature-controlled (water temperature over 25 C at extra charge) and allows swimming and exercising against a smooth current. 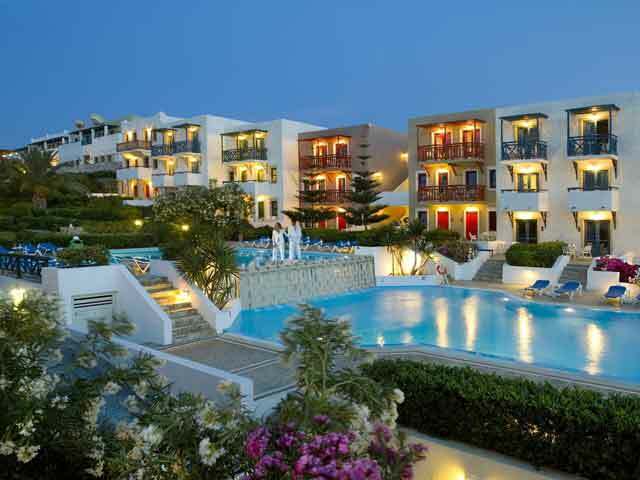 The landscaped garden offers direct access to the Villas Beach area. 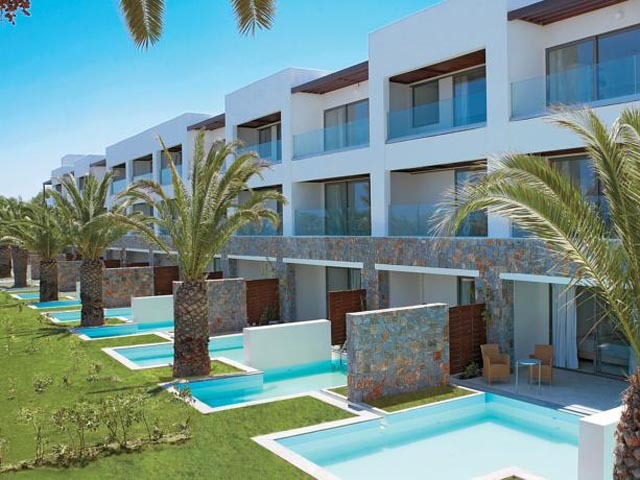 These elegant and spacious villas are the ultimate choice for discerning travellers. 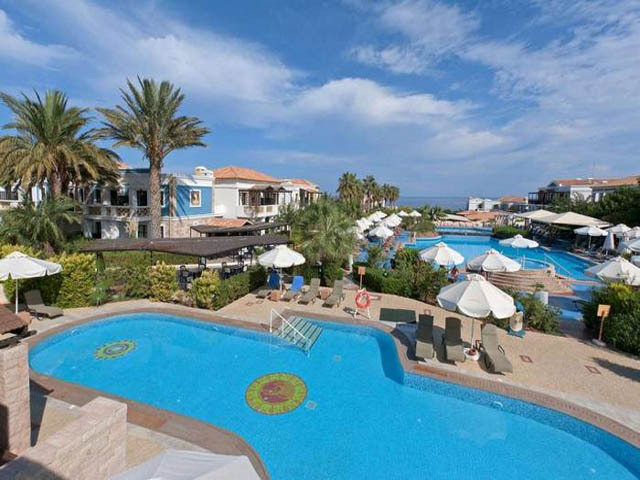 Located directly on theexclusive beach they feature two bedrooms and are perfect for a family with a nanny or two couples. The master bedroom has an en suite living area in an open plan style and a generous sea view bathroom. The luxurious bathroom features a double stone basin vanity unit, an impressive Jacuzzi bathtub, separate shower, WC and LCD TV.Stylish living area with a sofa bed which doubles as an extra sleeping area and bathroom with a Noir washbasin and separate shower.The living area leads to a second bedroom through a landscaped open air courtyard. The outdoor veranda with comfortable furniture offers magnificent views to the sea and the landscaped garden gives direct access to the Villas Beach area. 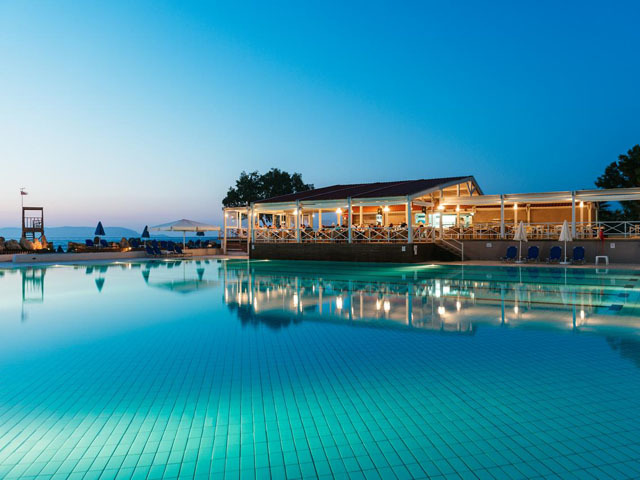 The private infinity pool is temperature controlled (water temperature over 25 C at extra charge) and allows swimming and exercising against a smooth current. These spacious and comfortable villas consist of one sea view master bedroom and a stylish living room. The landscaped courtyard gives a first impression of the luxurious scenery. The master bedroom features a king size bed set against a theatrical backdrop of coloured lanterns. Amazing direct views from the bed over the heated infinity pool, private gardens and the Cretan Sea. The luxurious en suite bathroom has an overflowing deep soaking Jacuzzi, aromatherapy, colour therapy bathtub, his & hers stylish washbasins, and a separate rain shower cabin.Experience the unique feeling by soaking up the bubbles whilst the water changes according to your mood. Two glass doors in the bathroom provide access to an outdoor landscaped area. The spacious area of the terrace includes the infinity pool surrounded with outdoor furniture and the landscaped garden. 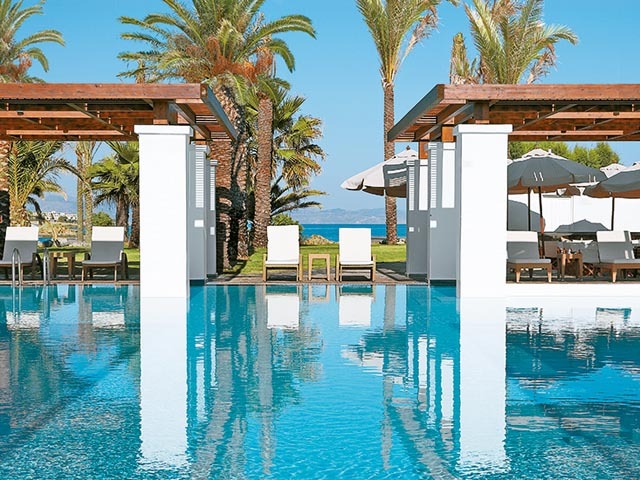 The private infinity pool is temperature controlled (on request: for temperature over 25 C an extra charge is required) and allows swimming and exercising against a smooth current. 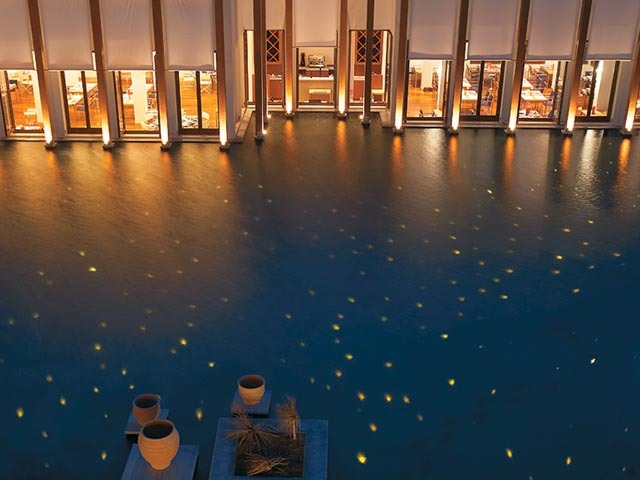 The evening lighting of the pool gives an outstanding feeling of romance. A funky and stylishly cool environment equipped with state of the art audio and visual entertainment units. These exquisite villas are impressive in terms of colourations, decorations, furnishings and style. They consist of an entrance hall, two bedrooms, a luxurious living room and two bathrooms. The master bedroom has direct view of the sea and its glass-fronted door lead to the private infinity pool with the built in sunken lounge. The swimming pool is temperature controlled (on request: for temperature over 25 C an extra charge is required) and allows swimming and exercising against a smooth current. The evening lighting of the pool gives an outstanding feeling of romance.The en suite bathroom is playful with Jacuzzi, aromatherapy, colour therapy bathtub, rain shower glass cabin. The secondary room with its private bathroom leads to an outdoor landscaped yard. A private garden equipped with outdoor furniture, sun beds and umbrella offers endless moments of relaxation and direct access to the Villa Beach. The cool and contemporary design reminiscent of a Mediterranean Beach House makes these villas ideal for a family or couples of friends who want to share their vacation. The yard entrance, with a private parking area in front and a small pond, gives a first idea of the inviting scenery. The ground floor features an entrance hall with a comfortable living room, a master bedroom with walk in wardrobe and en suite bathroom with Jacuzzi bathtub and hydro massage shower. The king sized bed is set against a theatrical backdrop of coloured lanterns.Large sliding glass windows bring the outside into the ground floor rooms. The terrace includes an infinity pool with a sunken bed in it, an impressive day bed for two in the centre of the terrace and outdoor dining and relaxing furniture. The private infinity pool is temperature controlled (on request: for temperature over 25 C an extra charge is required). The evening lighting of the pool gives an outstanding feeling of romance. The second floor of the villa includes a stylish lounge suite and sleeping quarters with a oversized king size bed. The luxurious wardrobe dressed with leather imposes in the lounge area. The deep soaking bathtub is standing free in the centre of the room, ideal for looking out straight out into the sea. The two stone washbasins with vanity unit and standing mirrors as well as the separate hydro massage shower cabin add comfort just behind the lounge area. The magnificent Grand Beach Residence, built directly on the first row of the exclusive villa area in front of the beach is ideal for seclusion and endless relaxation for large families or couples who want to share their vacation in utmost exclusivity and luxury. This unique accommodation offers over 300m2 of sleeping and living space with two private swimming pools, extensive gardens on the beachfront and two entrances.The master bedroom villa consists of a large master bedroom suite that features an entrance hall, two bedrooms, a luxurious living room and two bathrooms. 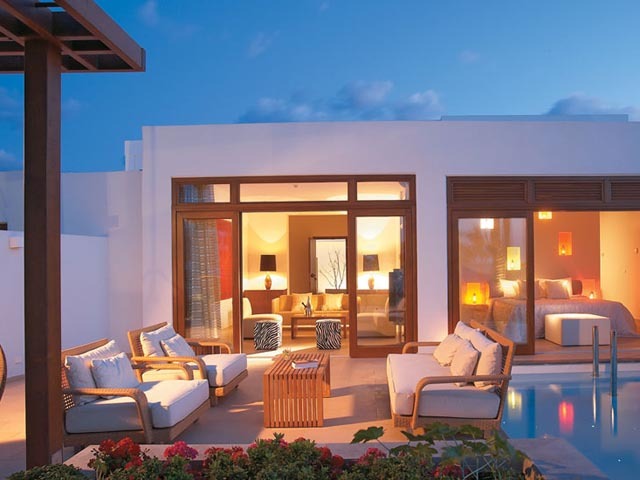 The master bedroom has direct sea view and wall-to-ceiling glass doors lead to the private infinity pool. The en suite bathroom is playful with Jacuzzi, aromatherapy, colour-therapy bathtub, glass rain shower cabin. The second bedroom with a private bathroom leads to an outdoor landscaped yard. A connecting door allows access to the adjoining second master bedroom villa. This elegantly decorated villa consists of an open plan master bedroom with a living area and a generous sea view bathroom. The luxurious bathroom features a double stone basin vanity unit, an impressive Jacuzzi bathtub, separate shower and LCD TV. The second bedroom with a 26 LCD TV, a bathroom with a Noir washbasin and separate shower, leads to a landscaped courtyard. 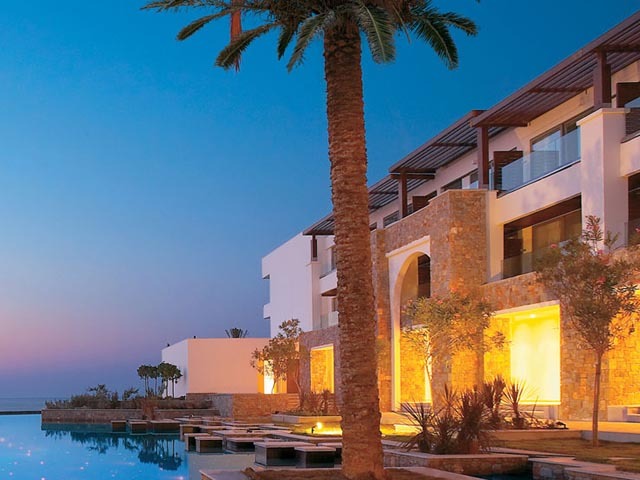 The luxurious residence opens onto extensive landscaped gardens with two infinity pools overlooking the Villas Beach area. 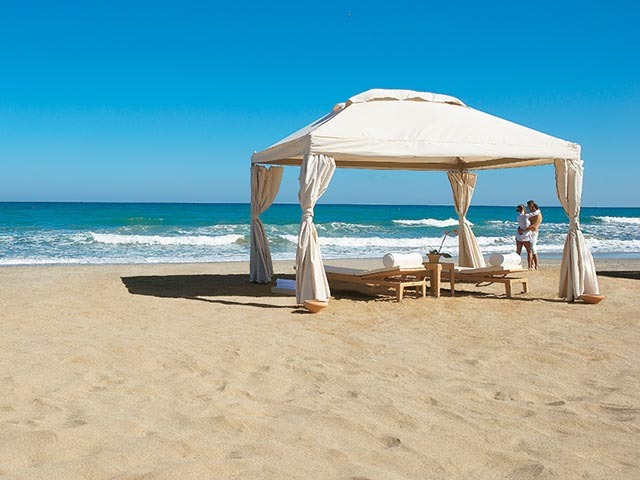 Outdoor lounge & dining furniture, sun beds and umbrellas offer endless moments of relaxation. The two private pools are temperature controlled (water temperature over 25 C at extra charge) and allow swimming and exercising against a smooth current. 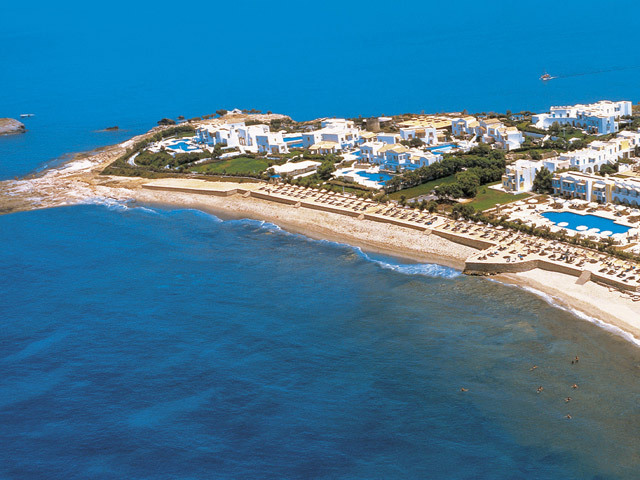 The ultimate accommodation in Grecotel Amirandes! A unique architectural idea for those wishing discrete luxury and comfort. It consists of two areas, separated by a stone-laid private path and it is located in the first row of the village in front of the beach.. The front open-plan area features a living room with a bedroom and a bathroom with Jacuzzi and colour therapy bathtub. Experience the unique feeling by soaking up the bubbles whilst the water colour changes according to your mood. The wide balcony doors lead to the private heated pool, terrace with seating arrangements and a large garden, hanging over the sea. 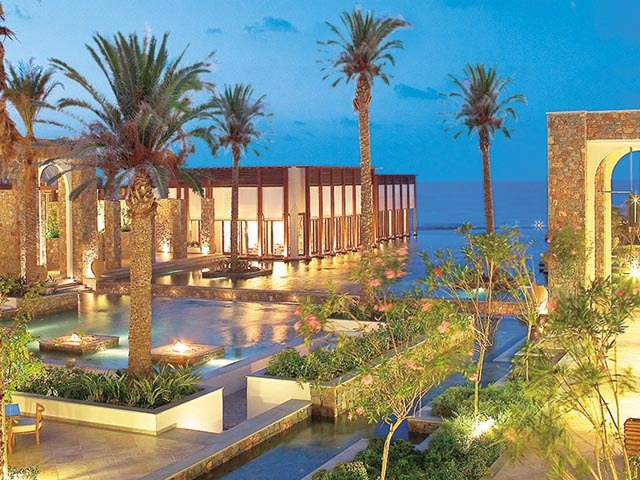 Furnished with sun beds, a Pavilion and an open-air lounge, the garden offers endless moments of peace and relaxation. 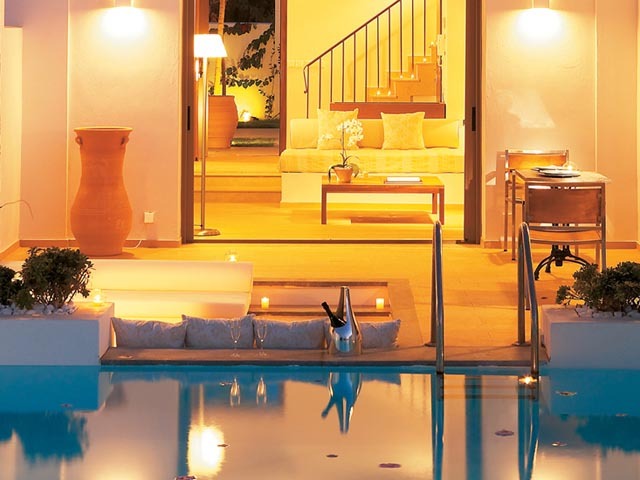 The private infinity pool is temperature controlled (on request: for temperature over 25 C an extra charge is required) and allows swimming and exercising against a smooth current.The evening lighting of the pool gives an outstanding feeling of romance. The second part of the Residence is exceptional and unique: it is the extravagant private Cave with stone laid floor and stone walls. It consists of a master bedroom with a king size bed on a raised wooden floor, a bathroom area with separate shower, toilet cabin, and a stoned vanity unit with two stone washbasins, a spacious stylish living room with home cinema, dining area with handmade Italian wooden dining table a fully equipped kitchen, a billiard, a round sized Jacuzzi bathtub, private sauna, in bathroom massage bed, cardio trainer and elliptical trainer. 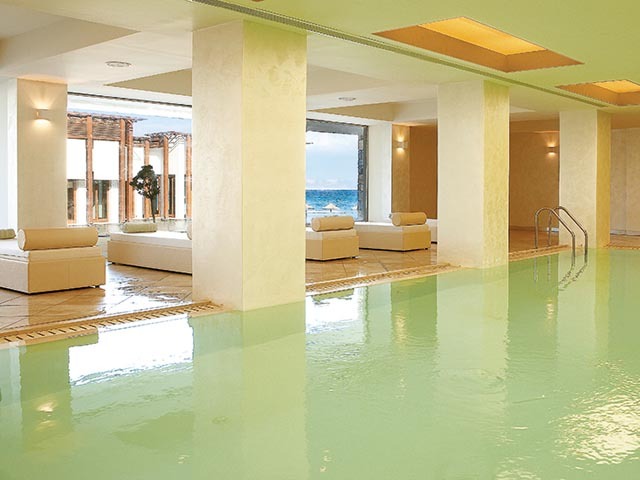 The ultimate accommodation in Grecotel Amirandes! A unique architectural idea for those wishing discrete luxury and comfort. It consists of two areas, separated by a stone-laid private path and it is located in the first row of the village in front of the beach. The front open-plan area features a living room with a bedroom and a bathroom with Jacuzzi and colour therapy bathtub, which is adjacent to a master bedroom and a lavish en suite bathroom. 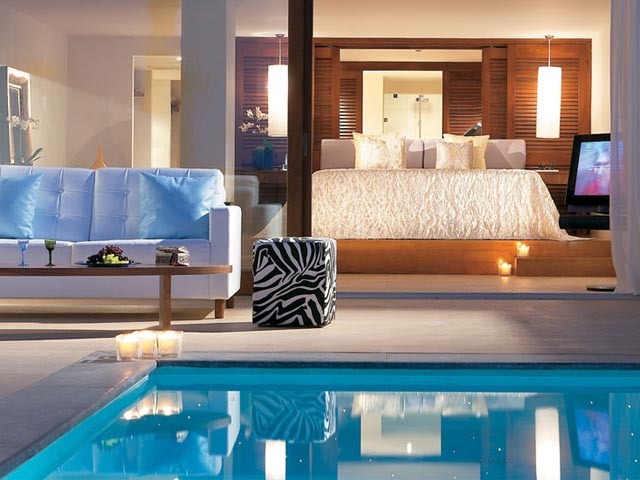 The king size bed on the master bedroom faces one of the two heated infinity pools and the Cretan Waters. The modern bathroom has an overflowing deep soaking Jacuzzi, aromatherapy, colour therapy bathtub, his & hers stylish washbasins, and a separate rain shower cabin. Experience the unique feeling by soaking up the bubbles whilst the water colour changes according to your mood. The wide balcony doors lead to the private heated pools, terraces with seating arrangements and a large garden, hanging over the sea. 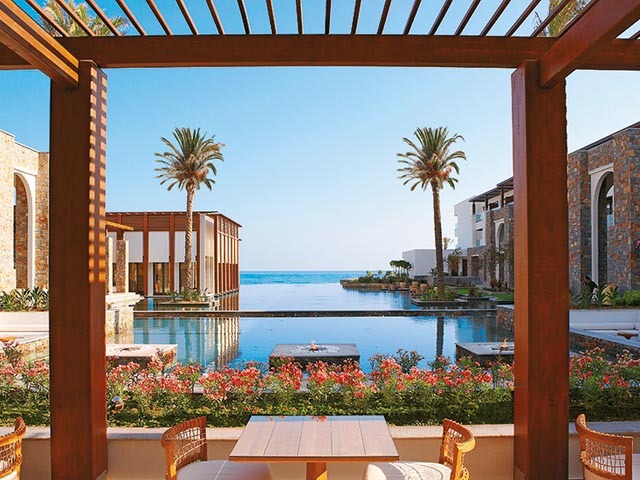 Furnished with sun beds, a Pavilion and an open-air lounge, the garden offers endless moments of peace and relaxation. 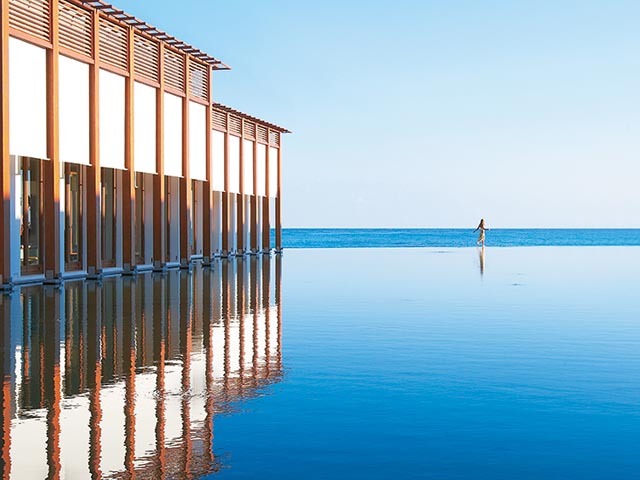 The private infinity pools are temperature controlled (on request: for temperature over 25 C an extra charge is required) and allows swimming and exercising against a smooth current. 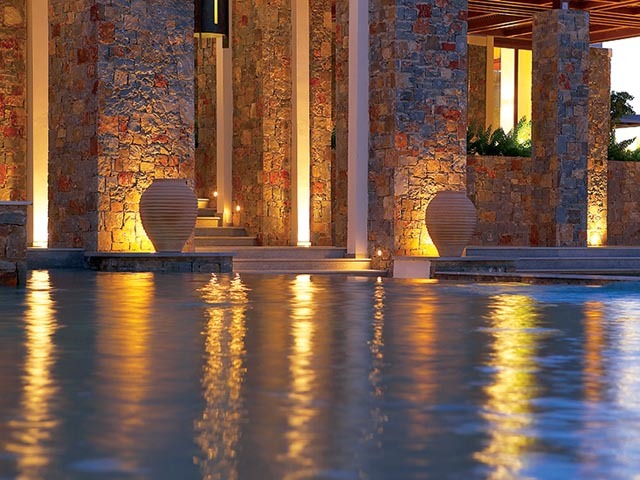 The evening lighting of the pool gives an outstanding feeling of romance. The second part of the Residence is exceptional and unique: it is the extravagant private Cave with stone laid floor and stone walls. It consists of a master bedroom with a king size bed on a raised wooden floor, a bathroom area with separate shower, toilet cabin, and a stoned vanity unit with two stone washbasins, a spacious stylish living room with home cinema, dining area with handmade Italian wooden table a fully equipped kitchen, a billiard, a round sized Jacuzzi bathtub, private sauna, in bathroom massage bed, cardio trainer and elliptical trainer. Traditional Mediterranean cuisine combines with international delicacies in the hotels main restaurant. Serving extensive buffets for breakfast and dinner - including healthy and vegetarian options and dont miss the chefs preparing fresh specialities. Four dining areas encircle the ornamental lagoon. 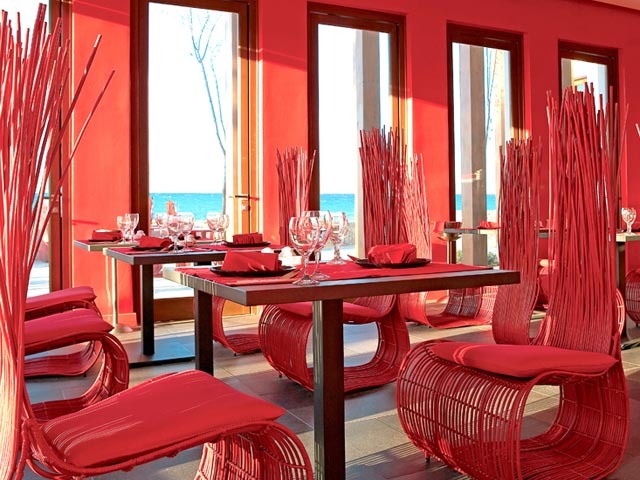 The elegant Lago di Candia restaurant features an international a la carte menu inspired by its spectacular waterfront setting. Floor-to-ceiling windows maximise the views across the romantically illuminated lagoon, beach and sea whilst dining in the evening. Childrens meal on request. Pablo Picasso drew himself as a Minotaur, the mythical half-man half-taurus(bull) creature that lived in the Labyrinth of the palace of Knossos, a few kilometers from Amirandes. He adored ceramics and created them for 25 years (1947-1973). An amazing collection of genuine Picasso ceramics, adorns the new Amirandes unique restaurant, the Minotaur in honour of ancient ceramic art and the way it inspired the masters of the 20th century. At Minotaur, truly stylish Italian food is our speciality. 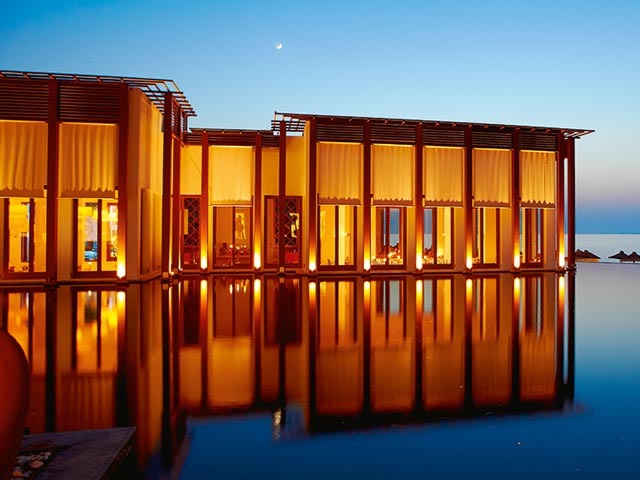 Located by the star-lit lagoon, Minotaur is an incomparable Italian restaurant of impeccable character. It embodies Italian style –classic sophistication and inimitable refinements. 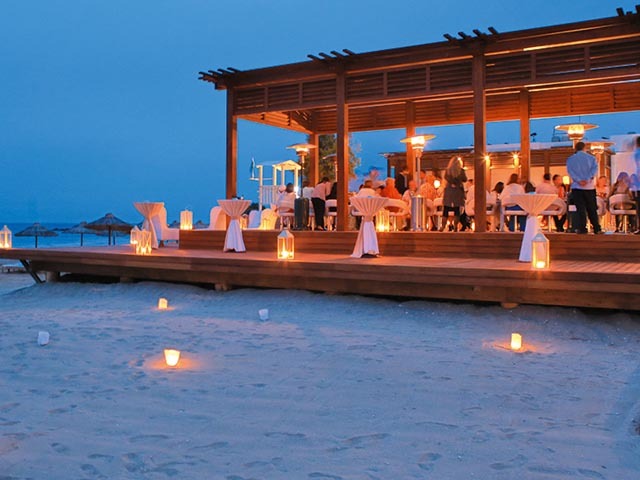 Petrino, meaning stone in Greek, is the Amirandes beachfront seafood restaurant. Savour simple, stylish, al fresco lunches with seascapes to match. Succulent fish and seafood are as fresh as the gentle sea breeze at this waterfront restaurant.Share a Greek meze with your friends, try the island delicacies or order the freshest fish and seafood in Crete from the catch of the day. Childrens meals on request. 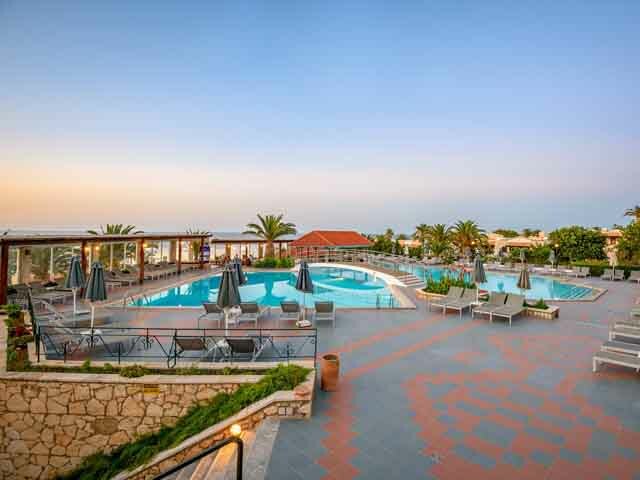 Xasteria pays tribute to Cretan cuisine with a menu bursting with island flavours. When Cretan people eat, they spend a long time, eating and drinking raki or wine while talking about everything under the sun. Xasteria recreates a village-style menu using the freshest ingredients from local villages including organic produce from Grecotels own Agreco Farm. 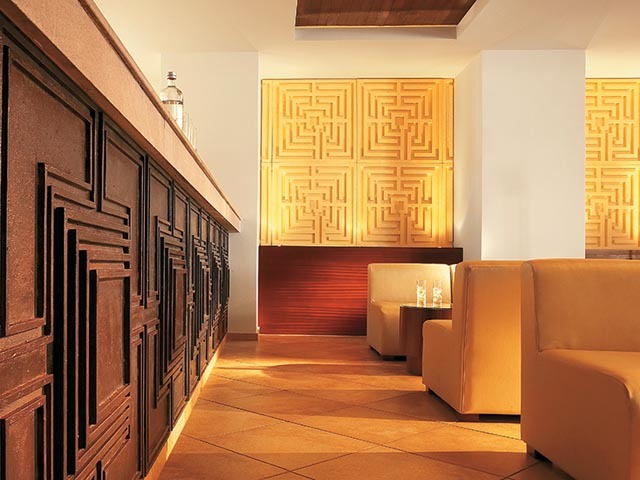 Serving oriental delicacies cooked to order, Blue Monkey features modern twists on Eastern favourites. Breathtaking sunsets create the perfect backdrop for an avant-garde Asian dining experience. Childrens meal on request. Create and customise your own dining experience, prepared and served in a location of your choice. From sunset cocktails and beach banquets to a private meal in your villa or special celebration aboard a yacht… the choice is only limited by your imagination! Grecotels Agreco Farm gives a whole new meaning to real experience. Founded by Grecotels owners on a 4-hectare estate near Rethymno, Crete, the traditional farm showcases centuries-old farming methods. The farm provides a fascinating insight into the organic production of the islands simple and healthy food – a must for any visitor to Crete. 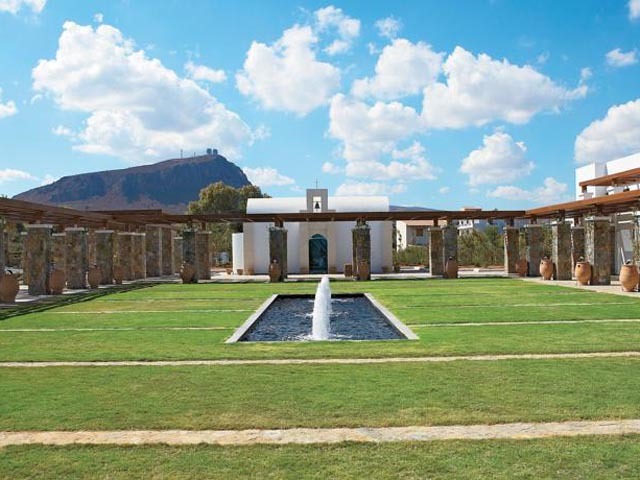 No trip to Agreco would be complete without a visit to the farms Taverna, where a sumptuous six-course menu of Cretan dishes, based on the farms organic produce. On Wednesdays visitors can play Farmer for the Day and learn just how it feels to make and eat home-made traditional Cretan food. Simply nowhere else in Greece can you live life on an organic farm. Families enjoy the Farm Experience, visit the mini zoo, while junior farmers (aged 6-12) can enjoy fun-filled farm activities including making dough & baking, picking vegetables and preparing dishes for their own healthy Cretan lunch. The Agreco Farm is open daily from 11:00 – 22:00. Enjoy the beautiful view, relax in natural surroundings and drink Greek coffee, raki or wine at the Agreco Kafeneio. Take home farm-produced products including organic olive oil, wine, olives, honey herbs and the new range of fragrances & body care products. Available at the hotels SunStore boutique. 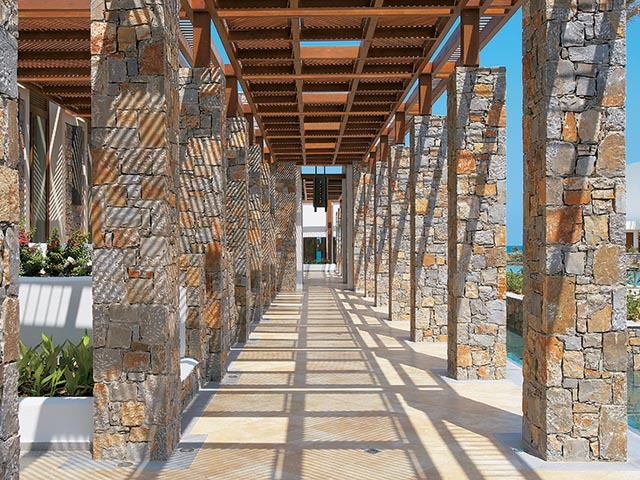 Open: April to October ... Amirandes is an exclusive beachside resort that epitomises Cretes most inspiring features: beautiful architecture, warm hospitality, excellent cuisine and stunning land and seascapes.